Ad ... Source: "Buffalo Illustrated: Commerce, Trade and Industries of Buffalo." Buffalo: The Courier Printing Company, 1890. Caption: Residence built 1855. Now 730 West ferry Street. Former home of Charles Wadsworth, James Adams, (who built the tower), Jesse C. Dann and John J. Albright. Burned 1901, and replaced by Mr. John J. Abright's present residence. 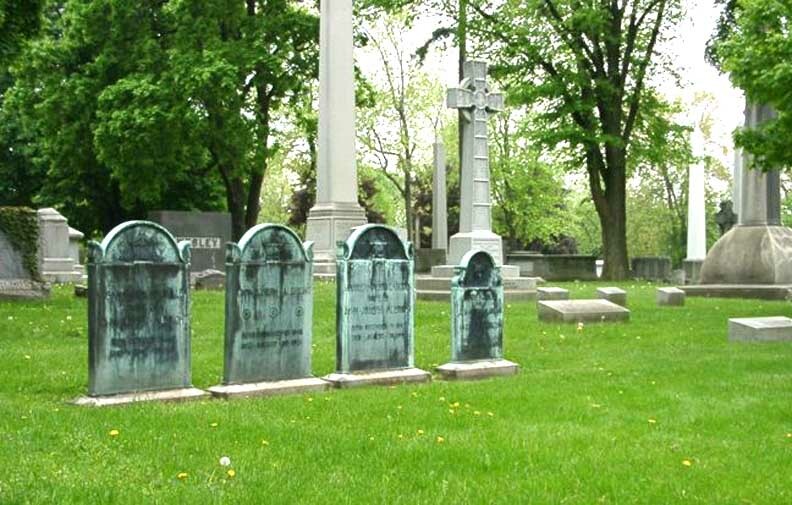 Four copper Albright memorials in Forest Lawn Cemetery, Section H.
Note large flat memorial on far right which is the E.B. Green memorial in the Albright lot. At that time, coal was in high demand in the western United States, and Albright got involved in railroad shipping, sending coal out West and filling up the empty train with grain to haul back to the East. In his first year of freight shipping, Albright turned a profit of $100,000. By 1871, Albright was working out of Harrisburg, Pennsylvania selling coal wholesale, along with a business partner, a man by the name of Andrew Langdon. He married Langdon's sister Harriet during the next year, and by 1873 they had moved to Washington, D.C., where Albright and Andrew Langdon started to work for the Philadelphia and Reading Coal and Iron Company. 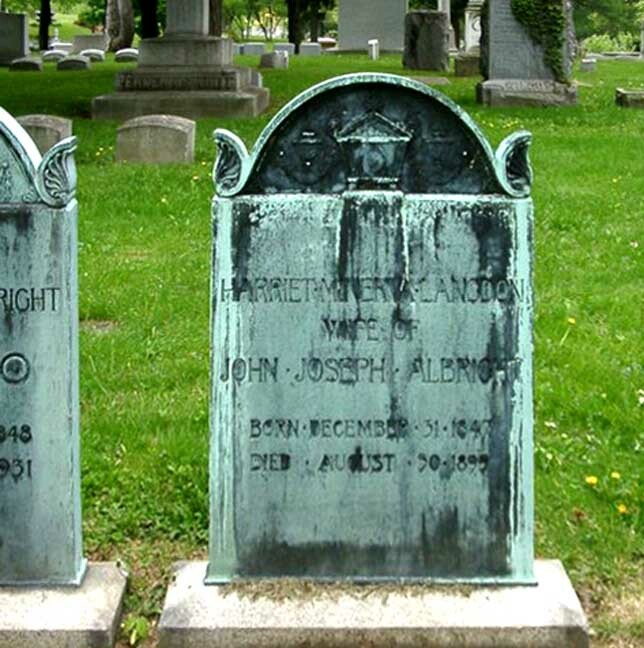 The oldest Albright children, Raymond, Ruth, and Langdon, were born in Washington D.C.
Much of Albright's time in Washington, D.C., before he came to Buffalo, revolved around the coal, rather than the asphalt, business. ... 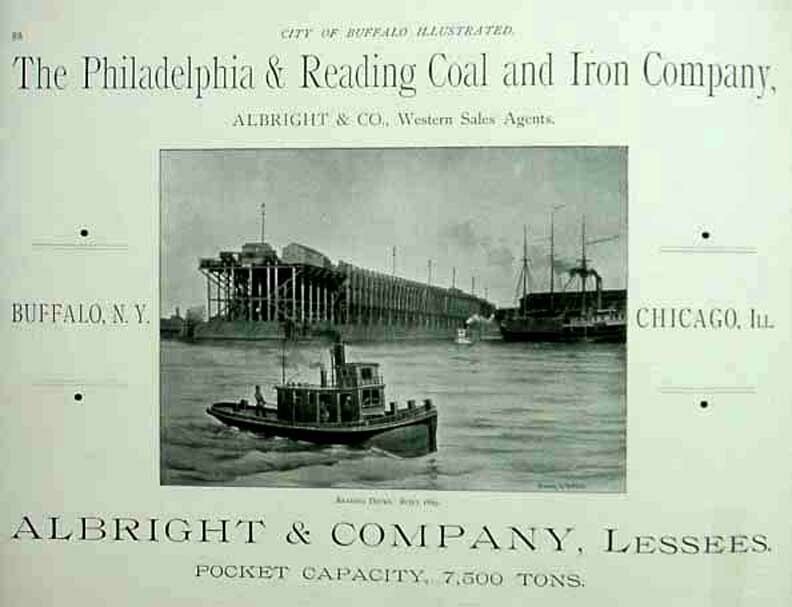 In 1883, the Philadelphia and Reading [Railroad] also tightened up its shipping routes and started shipping [coal] directly by rail through Buffalo. 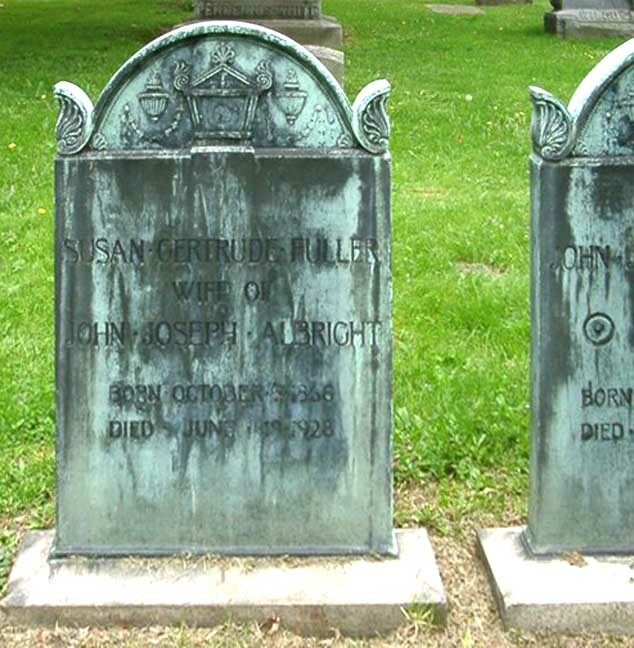 At this juncture, Albright moved his family to the city [Buffalo] and entered into another partnership, becoming involved with T. Guilford Smith. These two men handled all of the company's coal sold in Canada and Western New York, and Albright and Company handled all the Philadelphia and Reading's coal going westward from Buffalo. 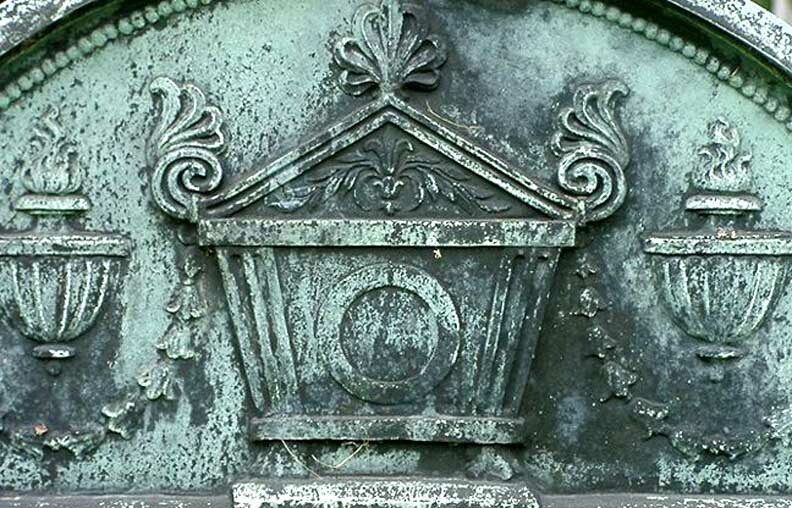 In 1895, Albright's wife, Harriet Langdon Albright died. Susan Fuller, a woman from Lancaster, Massachusetts, who was a recent Smith College graduate, was brought to Buffalo to educate the three Albright children. Within two years of her arrival in Buffalo, she married Albright. They had five children together: John Joseph Jr. (Jack), Elizabeth (Betty), Fuller, Susan, and Nancy. E.B. 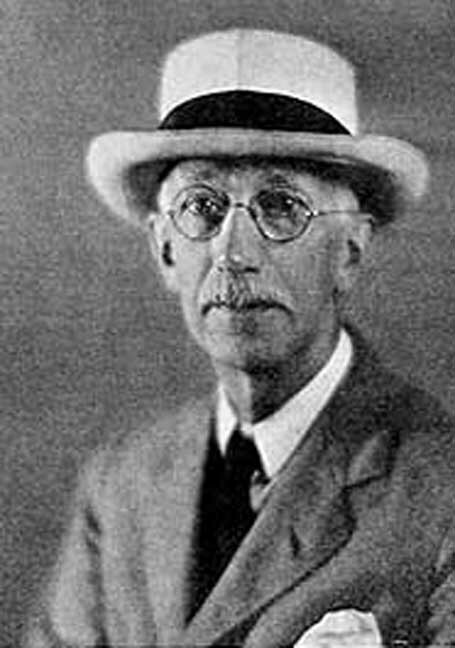 Green's most devoted client was John J. Albright, who first hired the firm around 1890 to design the Albright Memorial Library in Scranton. This commission came upon the death of Albright's father. Green and Wicks' design of the library was based upon the French Renaissance Musée de Cluny with its succession of steep roof dormers, engaged tower, and entrance with elaborate tracery. 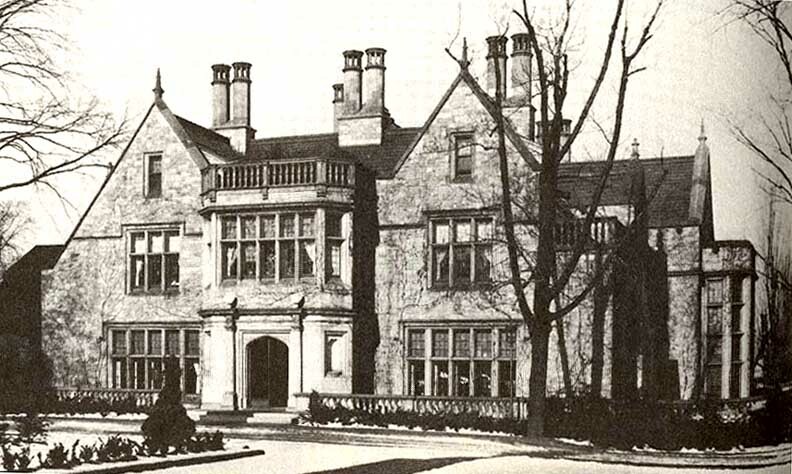 In 1897, Albright hired Green's office to design a complex to house an immigrant aid society, to be called "Welcome Hall." This organization, run by the ladies of the First Presbyterian Church at Symphony Circle, provided temporary housing, an infirmary, childcare, and vocational training for newly arrived immigrants. For the Pan-American Exposition they also designed the Albright Art Gallery. 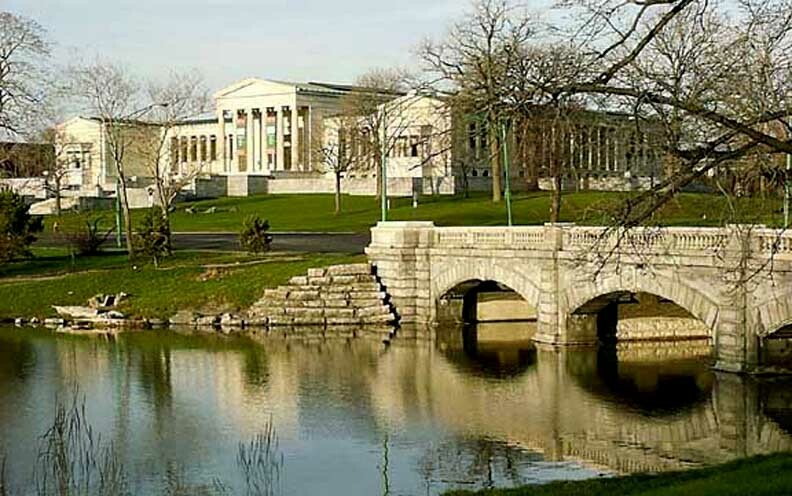 Although the building would not be completed in time for the Pan-American Exposition, the siting of the gallery on a knoll at the western end of Delaware Park Lake inspired Green to produce one of his best and most scholarly designs. In reverence for the English Landscape Movement, Green turned to English Renaissance gardens such as Stowe and Stourhead for design inspiration. These huge, private parks with their rolling meadows, shady copses, and picturesque lakes were dotted with Greek temples and miniature Roman pantheons, all framed in an embrace of hundred-year old trees. Realizing that this was one of the most important design commissions of his career, Green spared no effort in creating the most academically-correct Greek Temple his firm was capable of producing. 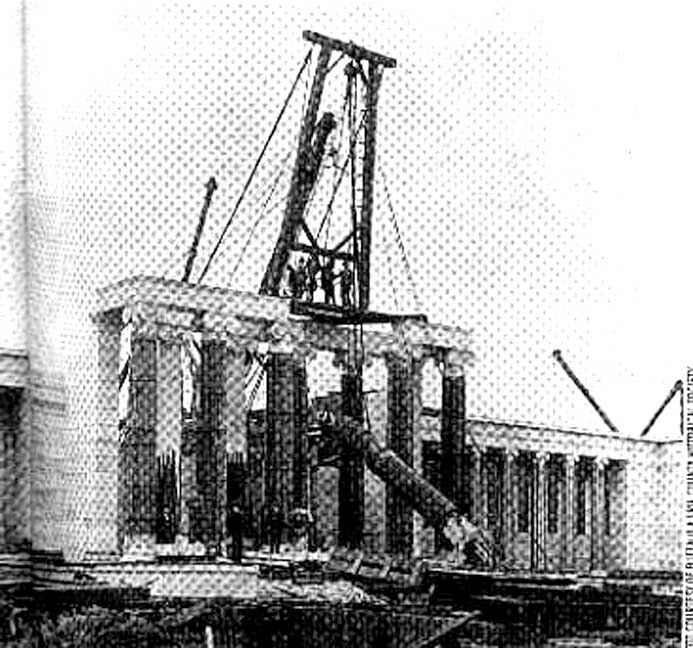 To this end, he persuaded Albright that the design would not be complete without caryatids, sculpted by Augustus Saint-Gaudens, supporting the roofs of the north and south porches (which were not installed until 1933). The success of this building brought two more art gallery commissions into Green's office for the Ohio cities of Toledo in 1912 and Dayton in 1927-30, when work was becoming scarce. "Buffalo Architecture: A Guide," Francis R. Kowsky et al. 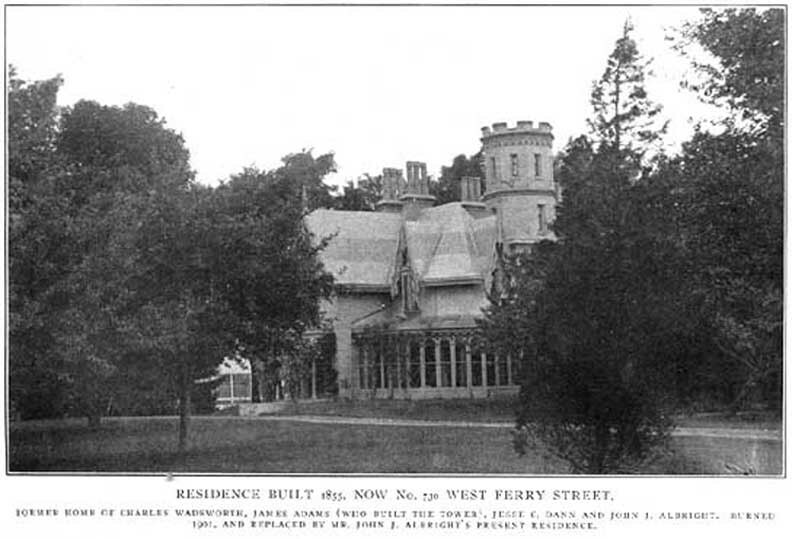 In 1901, when the Albrights' West Ferry home, previously the Wadsworth house, was damaged by a fire, Albright built a new house on his property. It was this home, the Albrights' second West Ferry house, that was widely known and still remembered. It was a large and impressive dwelling with lovely grounds and gardens. Albright commissioned Edward Broadhead Green Sr., a well-known Buffalo architect to build this new home. E.B. Green, a personal friend to the Albrights, also designed the Albright Art Gallery. 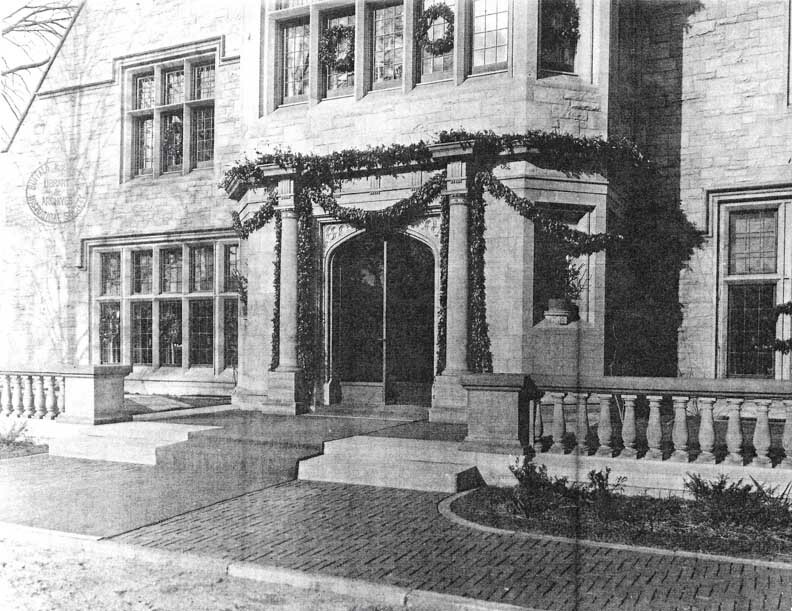 The Albrights turned their West Ferry home, which ended up being only a short carriage ride from the art gallery, into a center for Buffalo society. They entertained distinguished guests from around the world in their Gothic Tudor style home. E. B. Green fashioned the new Albright mansion after the manor house of St. Catherine's Court in England (it is this reference that years later gave the neighboring street St. Catherine's Court its name). A former neighbor of the Albrights recalled, "It was a huge house. It was not unlike the Rand House on Delaware, which is now Canisius High School, the same type of architecture." 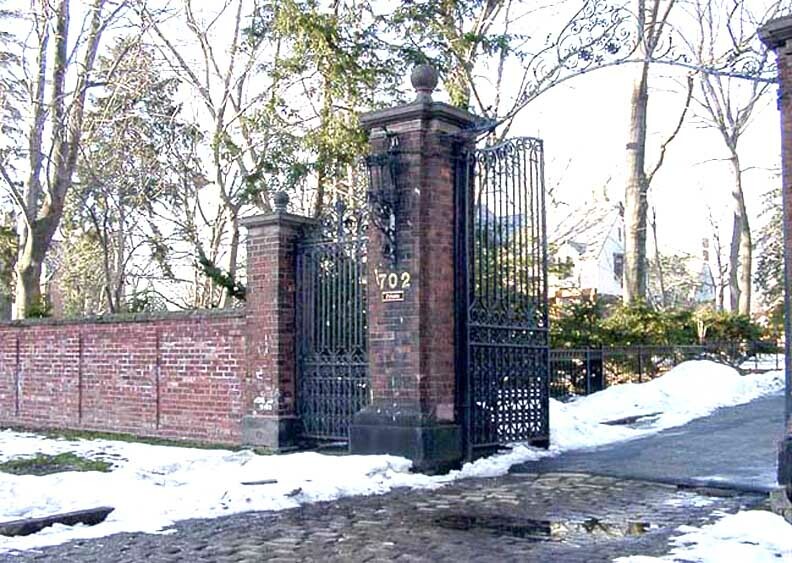 At the time this property first was known as the Albright estate, the streets now known as Tudor Place and St. Catherine's Court did not exist. Those streets, where today there are many lovely houses, were all part of the old Albright property or the Albright farm, as some called it. The Albrights' holdings ran lengthwise from 690 to 770 West Ferry and extended from West Ferry to Cleveland Avenue on at least twelve acres of land. 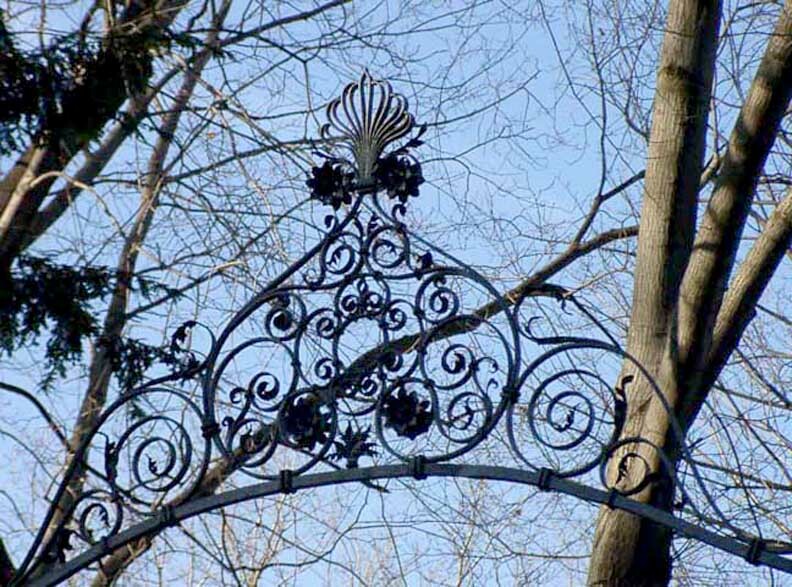 Albright financed a library in Scranton that was a memorial to his parents. Designed by Buffalo's Green & Wicks, it was opened in 1893. Albright was an owner of Lackawanna Steel Co.
Albright was instrumental in the distribution of hydroelectric power through the state. Albright lost most of his fortune in the Great Depression and in his investment in the Locomobile, a company owned by his brother-in-law, Anzi Barber. Beginning in 1892, the Olmsted firm worked with Albright in his capacity as president of the Depew Improvement Co. For information about this, see Arleyn Levee's The Olmsted Firm in Buffalo: The Next Generation. 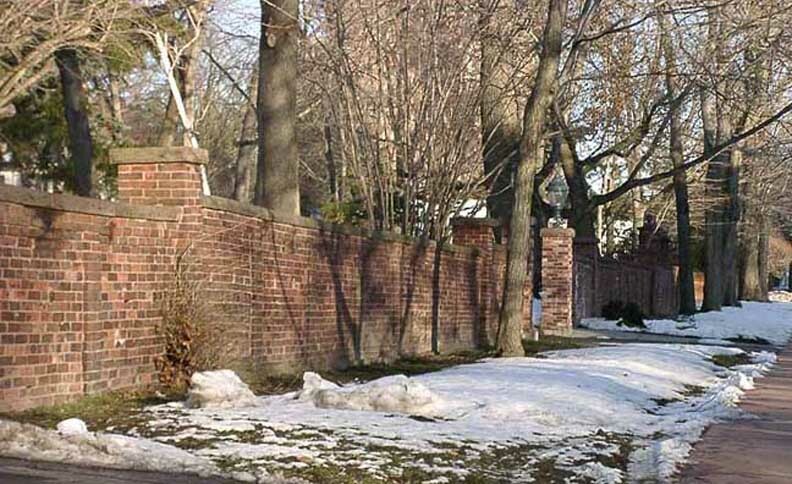 Albright founded the Nichols School, supported the Franklin School and donated the land for the Unitarian Universalist Church, as well as giving plants valued at $30,000 to $40,000 to the South Park Botanical Gardens. 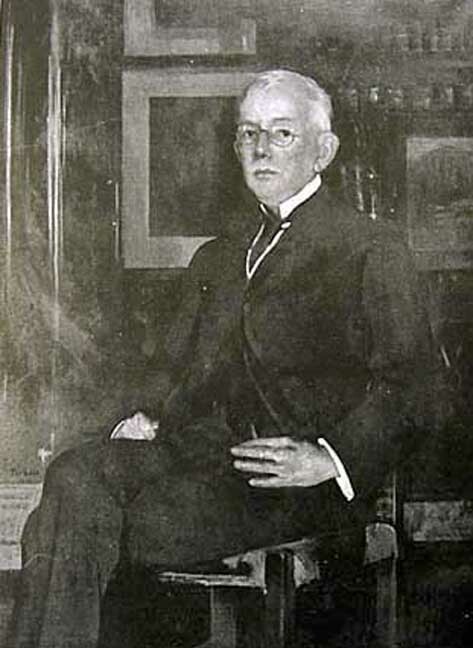 But his greatest gift came in 1900 with a donation of $350,000 so that the Fine Arts Academy could have a permanent home, which opened in 1905 as the Albright Art Gallery. When not engaged in transaction or attending to his award-winning orchids, Albright threw his grand parties at his Tudor estate on West Ferry, which was auctioned off, piece by piece, after his death. 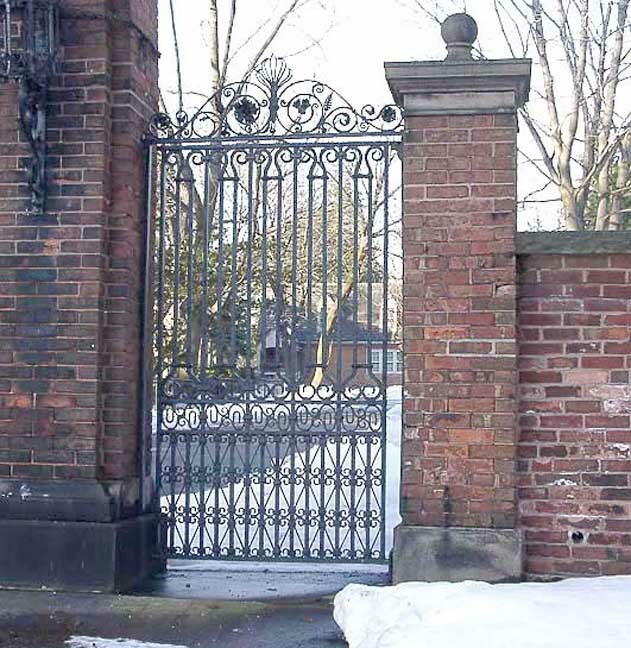 Albright is buried in Buffalo's Forest Lawn Cemetery.